I have a 4 year old female toy schnauzer named Bella. She likes to go everywhere with me and is a great companion. There are times, however, that while walking she will lay down and dig in. I don't know if she is just tired, is she doesn't want to go in the direction I am heading, if she is discerning danger or if it is a matter of control? Any ideas as to why she does this and how to get her to continue walking at my side? Comments for Stubbornness, tired or control? Thanks for sharing, Kai sounds like a remarkable dog. Kai does my medical alert dog, and she just turn 4 years old last week, a miniSchnauzer. There is a big difference in her digging in while stalking a squirrel, and if she is trying to get my attention. I rescued her when she was about 6 months old, and she actually picked up on my medical conditions - both of them - within the first few weeks. She jumps up on my right leg asking to go potty, my left leg to warn me of a parkinsonian episodes to take the medicine, and licks just the tips of my fingers and neck to give me a 20 minutes warning before I have a narcolepsy blackout. If it's late afternoon and I'm not lying down with a book or TV she realizes my afternoon meds haven't been taken, and she gets underfoot aggravating me until I realize the time. All that said, from day one she has come to me, sits, and raises either front paw. I learned she was "asking" something... I ask a few questions, always asking her to "show me." And she does! 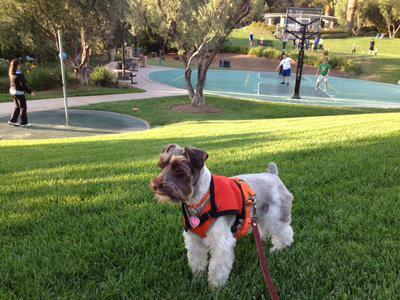 Other Schnauzer owners we've met around the trail also share the lift of the paw when they are asking for something. Next time maybe start asking your companion to show you why digging in? Kai considers me her human instead of her being my pet/dog, and takes extraordinarily good care of me. I only have my indepence because of her care. Medical Alert animals differ from Service Animals in that we have no clue how they sense wrong before it happens. They either have the gift or not; but Schnauzers seem to generally be one of the few smart enough for narcolepsy warnings. I tell everyone who stops to ask about us that God made dogs so special He gave them His name backwards!! I wouldn't worry too much, Schnauzers have minds of their own and a stubborn streak, she is just telling you she's had enough. If you want to train her out of it, take treats and coax her along when she does it. Max stops dead sometimes and stares at me and pulls to go in the other direction -it is just stubbornness. I have trained him that when I say NO! in a firm voice, he has to go in my direction!